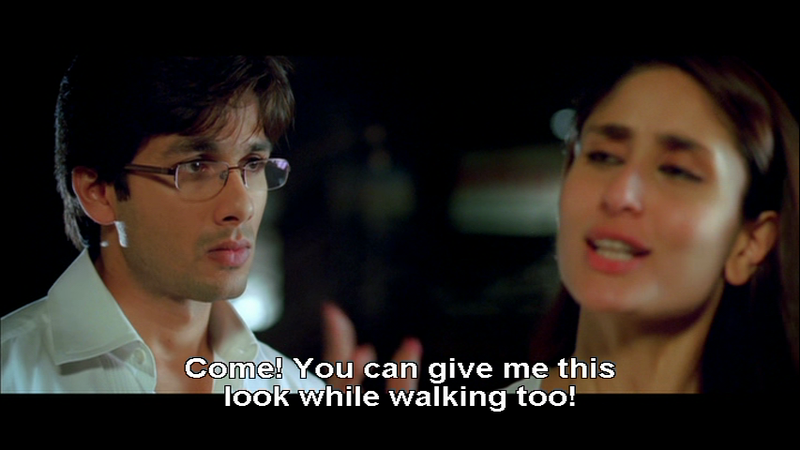 I remember Jab We Met as much for the circumstances of seeing it as for the film itself. Heather & I rolled up at Hoyts only to find the session was showing in the Halfpipe, where there are no seats as such, just numbered beanbags for two to share. So it’s just as well we were friends as I imagine it would be a bit odd to have to snuggle into a giant beanbag with a stranger. Especially if Heather that stranger kept muttering ‘beanbags are for cats not for people’. Imtiaz Ali has taken a run of the mill romantic road story and made it fresh and charming with some considered writing and character development. He worked wonders with his stars, drawing out excellent performances. 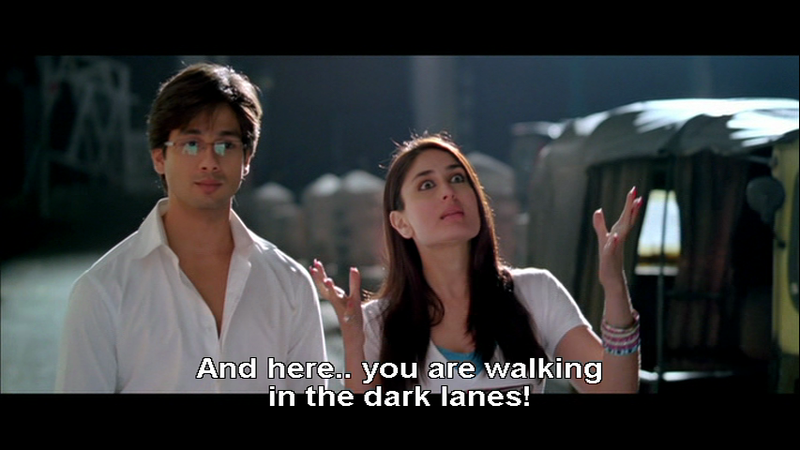 This is the only film in which I wholeheartedly like Kareena Kapoor (and her character), and it’s the one that made me first register Shahid Kapoor as a good actor not just as a great dancer and delightful eye candy. I wish they had spent a bit more on the visual effects, but I suppose they had to decide on CGI or eyeliner for Kareena. Aditya Kashyap (Shahid) is grieving for his dead father, jilted by his love and suffering from the stress of his high powered job and a legal challenge by his estranged mother. 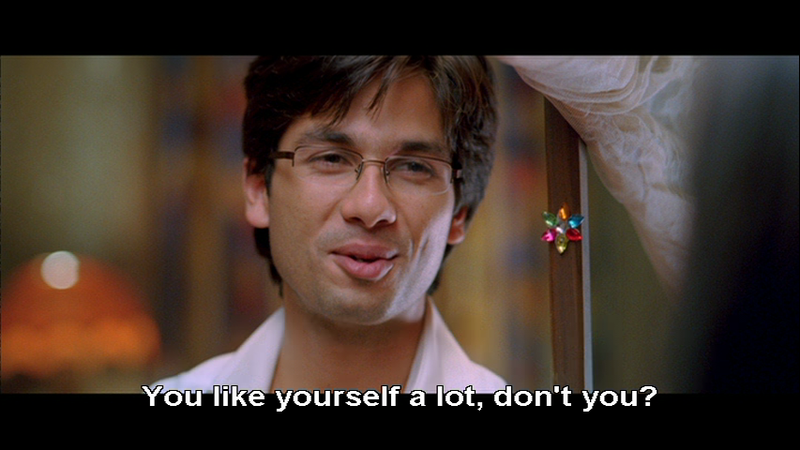 All this unfolds in the first few minutes in a near silent performance by Shahid. Aditya has a breakdown of sorts once he is done with his routine and obligations, and wanders heedlessly through Mumbai. He ends up on a train, oblivious to its destination as his may be more final. 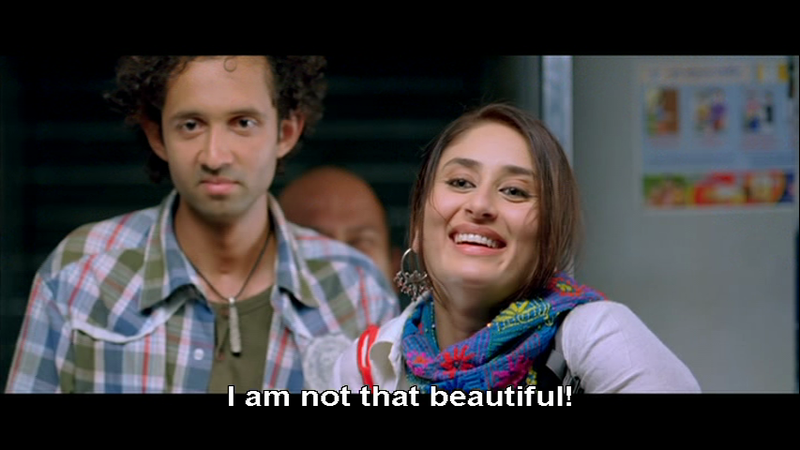 Geet (Kareena Kapoor) is a bubbly Punjabi girl, full of herself and a bit of an over-sharer. Fate puts her on the same train and she soon sees all is not right with Aditya. Her attempts to draw him out are clumsy and silly, but mostly motivated by kindness, and eventually he responds. The direction to Kareena may have been ‘do as you will’ – she is spontaneous and crackling with energy. Geet plans to elope to meet her true love, Anshuman (Tarun Arora). She is aware this will hurt her family, and Aditya doesn’t pretend he agrees with her. His view of marriage and family is tinted by the damage he saw his parents inflict on each other, and he envies Geet her happy home as well as her faith in love. Through Geet he comes to accept that his mother didn’t leave from malice, but rather to pursue the happiness she needed. They explore each other’s beliefs about the nature of love and what makes a good life, growing closer through these conversations. 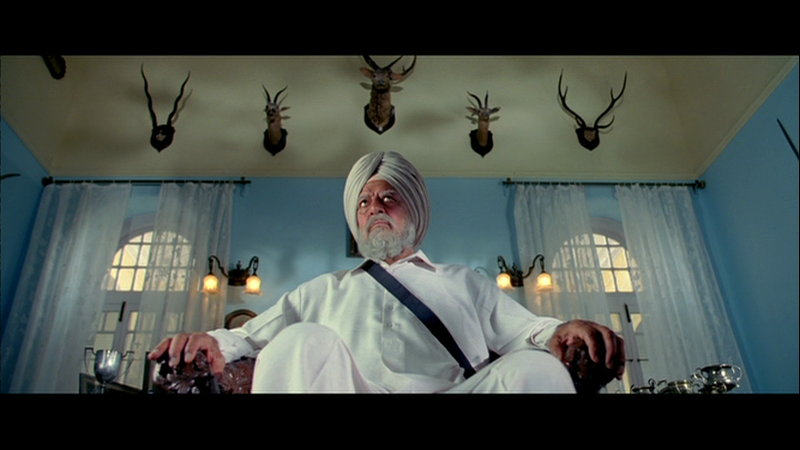 It was fun seeing Dara Singh as the patriarch, ruling the family with a strict but loving hand and scaring the bejesus out of Aditya, and I enjoyed the raucous family gatherings. For a number of reasons, including more family misunderstandings and a squad of enraged uncles, Aditya takes Geet to Manali and drops her at Anshuman’s. Their goodbye is beautifully captured as Aditya, just by saying her name, declares his love and she silently realises and refuses. 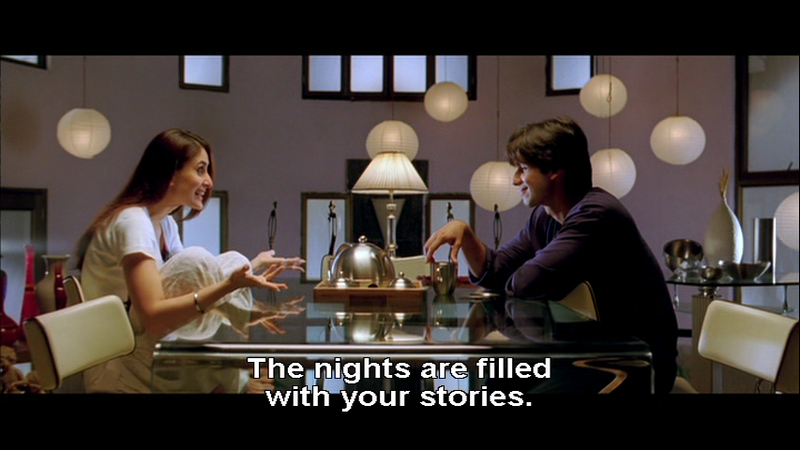 This is undercut by Kareena’s demented Snow White outfit but still, it’s a lovely moment. Geet’s confidence and resilience stems from knowing she has a family and home to return to no matter what. When she cuts herself off from that support she doesn’t blame anyone, but she does lose the spark and certainty that might have helped her move on when things go awry. 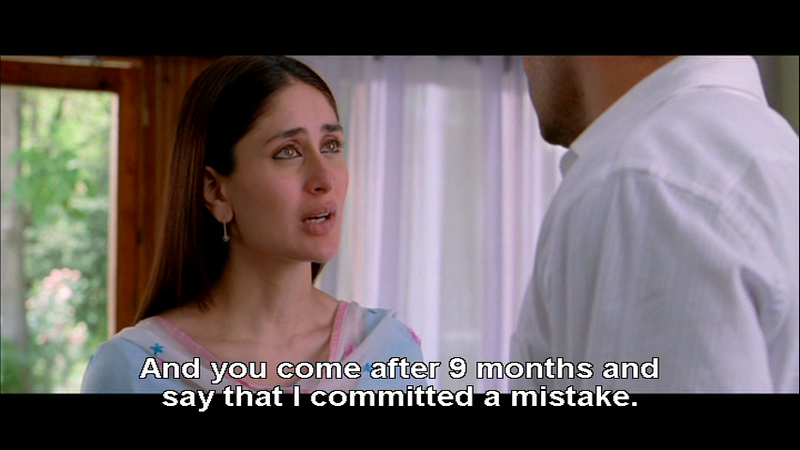 Kareena gives a painfully real portrayal of being ground down by disappointment. It is the loss of faith in her own decision making that leads Geet into further complications before the final denouement. It isn’t until Geet goes home again and gets her mojo back that she is able to see what she wants and more importantly, take action. Aditya on the other hand has gained confidence – losing Geet taught him that he could survive and keep going. He stops being the passive observer, mends fences with his mother, and deals with his unrequited love for Geet. His employees (especially the girl to the left of picture) might have preferred a bit less of the office singalong but there was no going back! When they meet again it doesn’t take long before the unguarded communication they had shared resumes. Aditya doesn’t try to hide his feelings and Geet doesn’t pretend not to know, and their occasional awkward moments are endearing. It is refreshing to see this kindly honesty towards characters’ romantic choices. Aditya is a more decisive man nowadays, but not one to force issues with Geet. 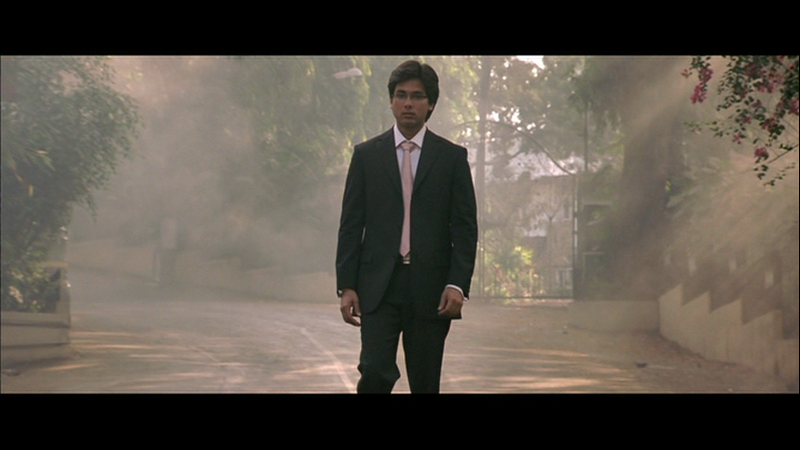 Shahid shows Aditya’s turmoil and temptation as he does his best not to influence Geet despite knowing that he could succeed. 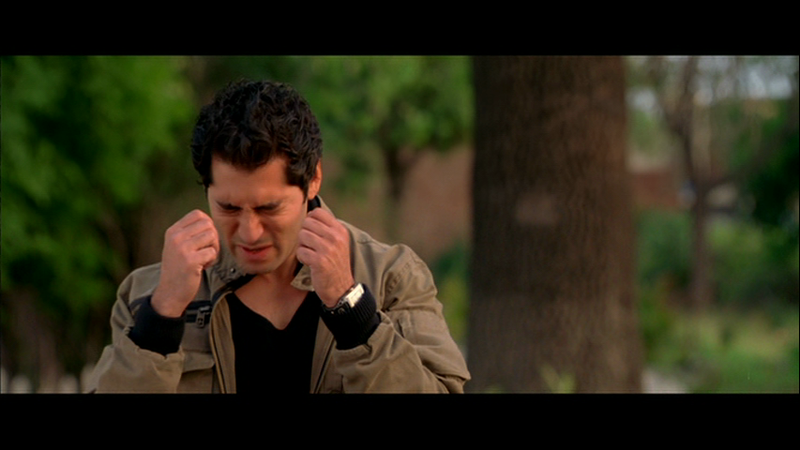 Anshuman is the fly in the ointment and the weak link in the film. I got the feeling Anshuman decided what was good enough for wealthy industrialist Aditya was good enough for him as there was no convincing motivation shown for him to change his mind and chase after Geet. Tarun Arora’s performance is the least successful in the ensemble, and certainly helped ensure I never felt any empathy for his character. The soundtrack is excellent and the songs are sufficiently different in style and scope that they suit the mood as well as sometimes providing a change of pace. Yeh Ishq Hai is a pretty travelogue with folkloric touches and some highly amused backing dancers that marks the shift to Manali. Tum Se Hi and Aaoge Jab Tum fill in the emotional life of Aditya and Geet once they parted, and depict the passing of time. Plus, the subtitle team were fully on board and made sure I didn’t miss a syllable. It’s always a shame when Shahid is paired with a mostly non-dancing heroine as it tends to limit the dances, but the fun choreography suited them both. The bhangra infused set pieces allow for high energy and sparkle, and Mauja hi Mauja ends the film on a high (thanks again to the subtitle team – working hard right til the end). The conclusion is inevitable, but there are many roads that could have taken us there. The care invested in writing for Geet and Aditya makes the ending satisfying, and Kareena and Shahid are natural and charming in their characterisations. 4 stars ! Heather says: I love this film! 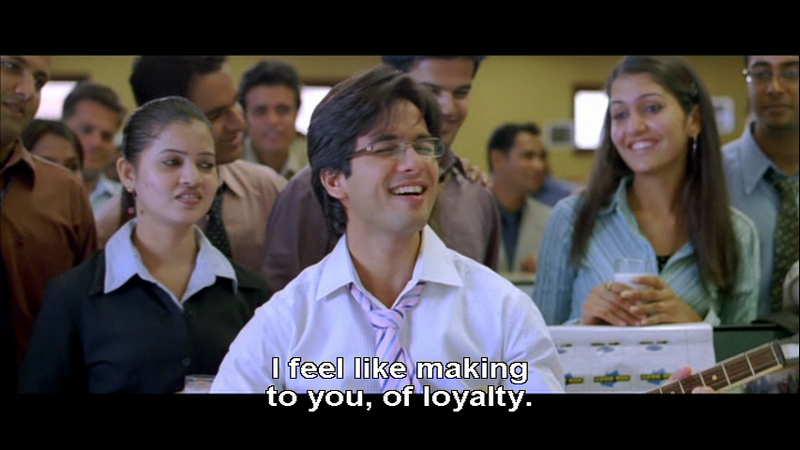 I’m a very big Shahid fan and this is one of my favourites. I can watch him in almost anything but it’s always better when there is an actual story and a chance for him to act rather than just flex at the camera. 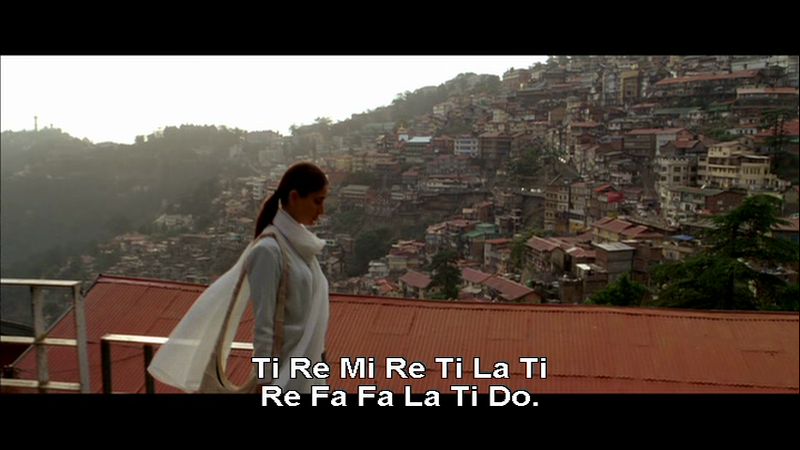 Like Temple, it’s also my favourite Kareena film since usually I’m not too much of a fan of her acting. She has been good in a few roles, Omkara for example is another where I think she does well, but generally she is too over the top for me. I suspect that her Geet is actually very similar to the real life Kareena, but the character here really suits her and the transformation to sad and unhappy Geet was also very well done. Her exuberance and vivacity bubble off the screen so that when we see her in Manali after her life hasn’t taken the direction she anticipated, the difference is very striking. 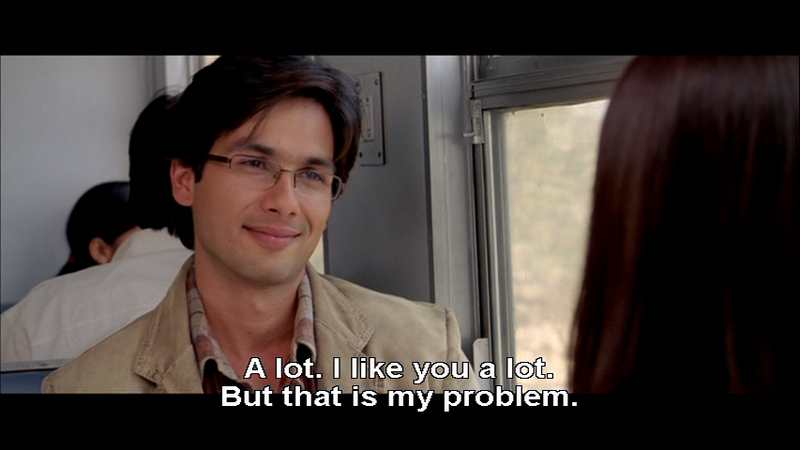 Shahid is excellent in his role as Aditya. His initial scenes where he is so lost and sad were very believable and he manages to convey his depression so well without words. Aditya’s gradual realisation that there could be more to life in the face of the juggernaut that is Geet and her family is also nicely portrayed. The family’s obvious unconditional love and support for Geet was one of the great things about the film and came across very well. 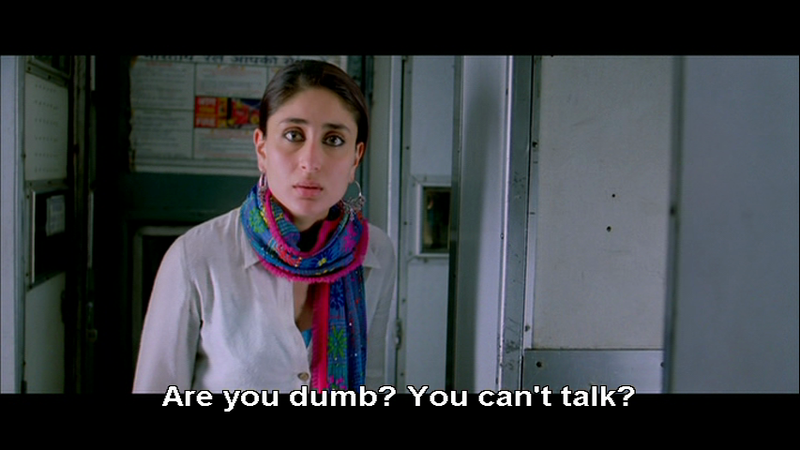 I love the look on Aditya’s face when he realised that Geet was not going to stop talking – ever! I’m quite sure that I’ve seen that look on my husband’s face from time to time as well. Anshuman was the one part of the story that didn’t really fit. While his initial reaction to Geet turning up in Manali was very believable I didn’t get any sense at all that he had a true change of heart later. It was all a bit sudden and seemed to be more a case of jealousy and wanting something just because someone else also wants it. Tarun Arora also indulged in a little too much scenery chewing for my liking but that may just be because I didn’t like his character much at all. 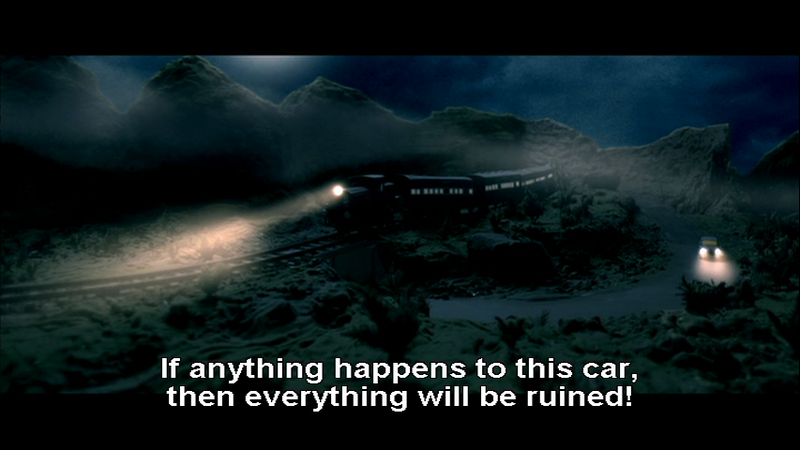 I’d totally forgotten about the dreadful toy train and car used in the chase scenes until I watched this film again. It’s so very funny when they seem to have spent so much money on costumes for Kareena and the set for Mauja Hi Mauja. Possibly the money also went on the songs since they are all excellent. I remember that this was the best soundtrack for me that year and I danced to most of them at Bollywood dance class at some stage. They still sound great. 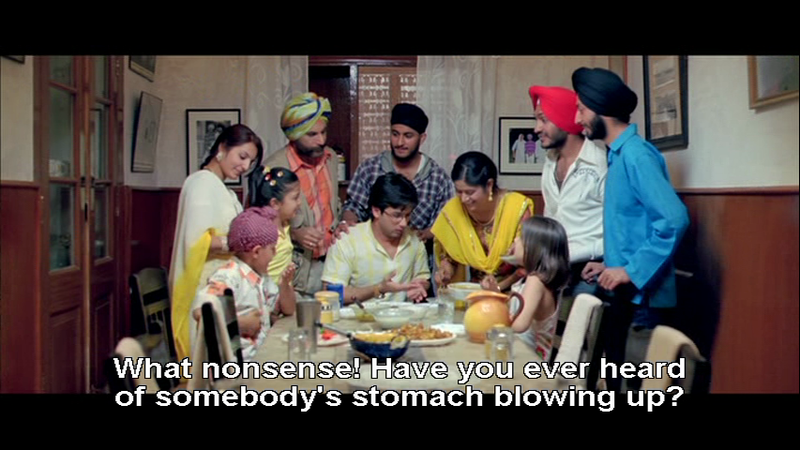 Such a shame that there isn’t more dancing by Shahid in this film, as that would have made it almost perfect. 4 ½ stars. I should also add that the beanbags provided a major workout since stomach crunches were required any time we wanted to reach our drinks. A truly unforgettable experience! This entry was posted in Bollywood and tagged Bollywood, Dara Singh, Hindi, Imtiaz Ali, Jab We Met, Kapoor Khazana, Kareena Kapoor, Pritam, Sandesh Shandilya, Shahid Kapoor, Tarun Arora. Bookmark the permalink. Totally agree with both your reviews !! In the song Aooge Jab (my fav.) Kareena shows her Kapoor blood..her expression changes from her excitement, to confusion, to misery in a few short secs, a display of her acting talent (which I used to question). And like you, I think Anshuman is the weak-link but provides good comic fodder later on so is excused!